A year to help » COMMENT: why am I not as brave as this woman? A little aside before I tell you what happened when I took Peanut and Poppy to the vets. Why I am I not as brave as this woman? 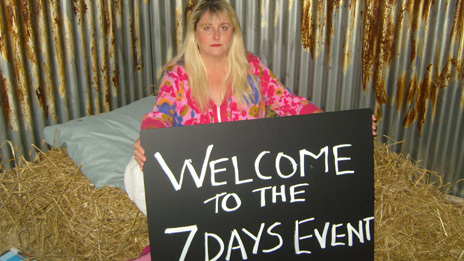 I’m very impressed by this lady who slept for seven days in a small enclosure to highlight the issue of puppy farms (where dogs are mass-bred in poor, cramped conditions to be sold on to pet shops and on the internet and to unsuspecting owners – which is more common than you think. Will write more on this later). I wish I was braver and could do a stunt like this. Maybe I could cut my leg off and sell it for cheap in a low-welfare supermarket. But truth be told I just don’t have the balls (actually that’s because I chopped them off to bring awareness to neutering issues) . No, but in all seriousness, good on her. Total admiration. People like that are my heros, I really hope she made a difference..
Could we not put David Blaine in a rabbit hatch for a while and suspend him over the Thames? For like… a few years? Previous Post: Day 47: what do I do with two baby staffies? Next Post: Day 48: Not a nice blog post.